OCEAN CITY – A cooperative effort to address homelessness in Ocean City is finding some success, according to local officials. The Worcester County Homeless Outreach Team (HOT) has been able to help six homeless individuals secure housing since it was launched earlier this year. “We have to come up with some permanent solutions but we’re chipping away at it,” said Claudia Nagle, executive director of Diakonia. HOT is a is a partnership between the Worcester County Health Department, Local Behavioral Health Authority, Department of Social Services, Ocean City Police Department, Diakonia, Ocean City Crisis Coalition, and Atlantic General Hospital. It was created to offer outreach to homeless individuals throughout the county. The effort began, however, in Ocean City, as homelessness in the Boardwalk area has been a cause for concern among residents and visitors. Resort officials have cited complaints from tourists and police reports occasionally include individuals with “no fixed address” who have been charged with things like disorderly conduct and burglary. “We started it there because the Boardwalk has gotten a lot of press,” Nagle said. 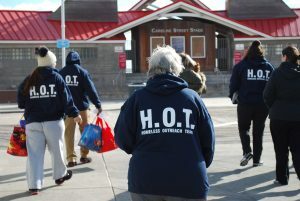 To address the issue, the HOT team conducts bi-weekly outreach as a unified group, assessing the needs of the homeless. Volunteers provide those they encounter with information regarding shelters, food pantries, behavioral health resources and even help people obtain birth certificates and identification. In addition to connecting six people with housing, the team has treated others for minor illnesses and injuries and several have been referred to services offered by Veteran’s Affairs. Representatives from the various agencies involved credit HOT’s cooperative approach with bringing about its success. Ocean City police officers are among those involved in HOT. Like the other partners, Nagle attributes the program’s success to the combined efforts of its many members. She said all of the HOT members had different relationships with different individuals. While the initiative has brought housing to some people, she doesn’t expect homelessness in the resort to disappear. She stressed however that community members should remember that homelessness was a complex problem. 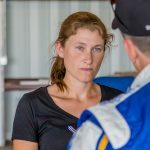 Nagle and other HOT participants are pleased with the initiative’s early success in Ocean City however and hope to expand the program to the rest of the county. “It brings the resources of many together and it makes the job easier,” she said.